Mike Schultz is an American politician from Utah. He is a Republican member of the Utah State House, representing the state's 12th house district. I was a pro snowmobile athlete at the top of my game, and in 2008 suffered an injury while competing that cost me my left leg above the knee. Seven months later, I engineered my leg called the “Moto knee” and eventually went on to patent the “versa foot”. 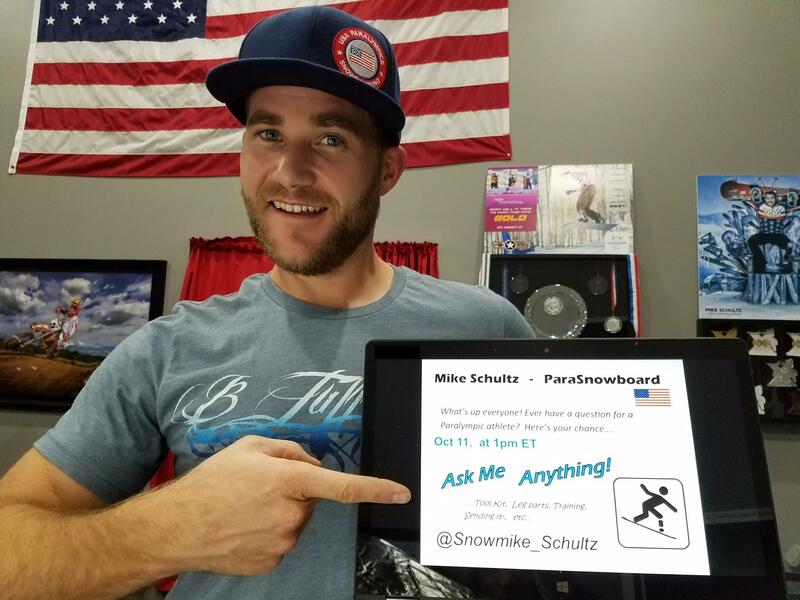 Now I'm an 8-time X Games gold medalist in Adaptive Snocross and Motocross and currently a member of the US Snowboard team not only competing in Pyeongchang, but providing most of the US snowboard and ski team with their equipment. In 2010, I founded my company BioDapt where I manufacture prosthetics for athletes/ veterans wanting to get back into sport. How does 'at home' 3D printing help amputees in general? Is it just anecdotal one-offs, or is it a mass movement? That's a great question! I was actually working on a 3d print design this morning. This new technology is changing how things are designed and developed for both individuals and large companies. It's very exciting that pretty much anyone can have access to a printer and come up with their own designs and equipment. There is still a big difference between a home workshop printer for creating models and a printer that can make a durable, finished useable product. But still very useful and fun to work with. Thanks for the question! Cookies… that may be why they call my ‘Monster’ Mike aka cookie monster  Lol! How does international sports define/regulate prosthetics? What keeps an approved prosthetic foot from being more springy than the next competitor, or last year's winner? What's the threshold for cheating? I’ve only really been focused on the rules of the Paralympic snowboarding since that is where our BioDapt equipment is being used. I’m not real familiar with the track & Field / running sports rules. I just know they cannot be ‘powered’ equipment and there are certain size/length/shape parameters the equipment has to fall within. There are far more rules and regs in the running sports compared to snowboarding. Hmmmm, maybe... does Eric receive lots of money in the mail?? Haha, no i'm not related. How disappointed were you with the horrible downfall of Oscar Pistorius? What did he represent to you before it all went so tragically wrong? I viewed Oscar as an extremely talented athlete that did a lot of great things for the world of para sport coverage and technology, so it was very difficult and disappointing to watch his story unfold the way it did. How much is a wheelchair allowed to be modified for olympic sports? how are standards set? I am not familiar with any of the standards or rules with wheelchair sports. My focus is on lower limb prosthetic equipment. I know there is a ton of technology and testing that goes into competition chairs to make them very strong and lightweight. what's the most exotic material you've seen used in a prosthetic? The most exotic is a relative term... there is a lot of titanium and carbon fiber used by many manufacturers. I'd have to say the most exotic material I've seen used would be some of the materials being used in 3d printed parts- 'proprietary blend' that is extremely strong and lightweight. Does having a prosthetic give you any sort of unique advantages in competition? Good luck! I love this question! There may be just a couple advantages that come from using a high tech prosthesis; one, my prosthetic foot doesn't care how cold it is and won't get frost bite. two, if i break my prosthesis, it doesn't hurt and the recovery time is a matter of changing a few parts. Lol! The reality is that your natural legs and limbs will never be outperformed by mechanical components. The equipment, may perform very specific movements faster or stronger, but the limitations of weight, power and how they are attached and controlled could never match a healthy and fit athlete. Cool that you make prosthetics for other people. What is the process? Is it very individualized to the specific injury or does the technology basically stay the same and just the fittings are customized? What was it like when you got injured? What was the injury/recovery? How did you deal emotionally. Thanks and wish you the best. Whew....this answer could take a while so i'll just keep it simple. It was definitely a hard hit emotionally and physically. I spent 13 days in the hospital recovering. After a lot of physical rehab i started walking on my first prosthesis 5 weeks after my amputation. I could have got super depressed thinking about what i couldn't do, so i really tried to focus on the things i could do or think about how i would adapt to the things i wanted to. a few months later i started to develop my prosthetic knee to allow me to get back into riding motocross and seven months after my injury i raced at the Summer X Games Adaptive supercross event and won a Silver Medal. There were so many things that had to work in order for me to be there and ready. I had a very positive and productive goal that i focused on and that's what got me through the toughest times. Thanks for the question! it used to be my wife Sara but she got block passed my 3 year old daughter Lauren! Lol. Best mountain in Canada which would you pick? I've only ridden on 3 mountains in Canada and of those, I'd have to pick whistler. Such an awesome area! Did anyone give you a leg up in order to come up with the designs for the prosthetic? Also, are you a foot shorter now? I jest, I jest. Thank you for the AMA. hahah that's awesome!! Well, i actually design all of my prosthetic components and work with a few other people/companies to bring my designs into a finished product. I actually gained 6 more feet since i lost my first foot. :) i have a few for everyday and a few for sports. Hi Mike, do you ever feel 'phantom limb'? Like, the sensation of an itch on your no longer existing foot. Yes, I dealt with some extreme phantom pain for the first couple months after my amputation. Once I started walking on my prosthesis, it started to fade away. I still have plenty of phantom sensation everyday, especially after a long active day. I still have the occasional 'pain' every now and then, that mostly feels like a cramp or pins & needles in my foot that is no longer there. I went to watch wheelchair rugby at the Invictus Games last year, and it was the COOLEST sport. I hate that Paralympic athletes don't get the same type of TV coverage. Do you know if this is something that's slowly changing? Is it something you'd like to see change? All of us para athletes wish for more/better coverage to showcase our sports and events. But, I will say there has been a lot more coverage over the last couple rounds of Paralympics. There are so many unique and incredible stories behind the athletes about how and why they are competing. I believe this year will have much more coverage than even the summer games in Rio. Thanks for the question!